Promotion of new products shouldn’t be confined to just plain digital or offline strategies – it should include your launch plan as well. Start marking your calendar because the very first step to launch is deciding on a date. This may seem trivial, but this is one of the most important steps. It is incredibly crucial to avoid launching on a special date. For example, launching a new collection on the same week as Black Friday sales would dampen the hype for your brand as most consumers would be on the lookout for bargains instead. Spending power typically decreases during the end of the month – due to lower funds. Necessities such as food and petrol are prioritised while unnecessary luxuries such as new clothes are usually postponed to the following month. Therefore, launching your collection during the end of the month might leave most of your audience putting your brand on the bottom of their priority list. The spending power of consumers are usually increased during such times. Leverage on the increased consumer spending power during such times by launching seasonal newness. Doing so aligns your new collection with the demands of consumers, effectively using the festive season to your advantage. An example would be launching a new collection of swimwear a week prior to spring break – mainly applicable to countries that partake in spring break like the United States. In conclusion, it all boils down to providing the most relevant value to consumers at the right time. The new stocks should arrive before launching – this is so that you can do visual merchandising. Most new-in items are usually displayed at the front of the store. Pay attention to the small details of your store display such as colours, themes and even the fonts for signages. You want to deliver the right story or message of your brand through the window display. Think of who you want to attract with your store display with your new collection and consider the most effective display for it. Ensure that the layout of the rest of the store is mapped out accordingly, focusing the attention on the main attraction – the new collection. With a set launch date and a fully-prepped store, the next step is to plan out and execute an actionable marketing campaign. The main aim of your marketing campaign is to build anticipation to the official launch of a new collection. A marketing campaign resembles a sales pitch that targets a wider group of audience. Integrate their needs and lifestyle to your campaign. It is always easier to sway consumers when their needs are directly addressed by your brand. 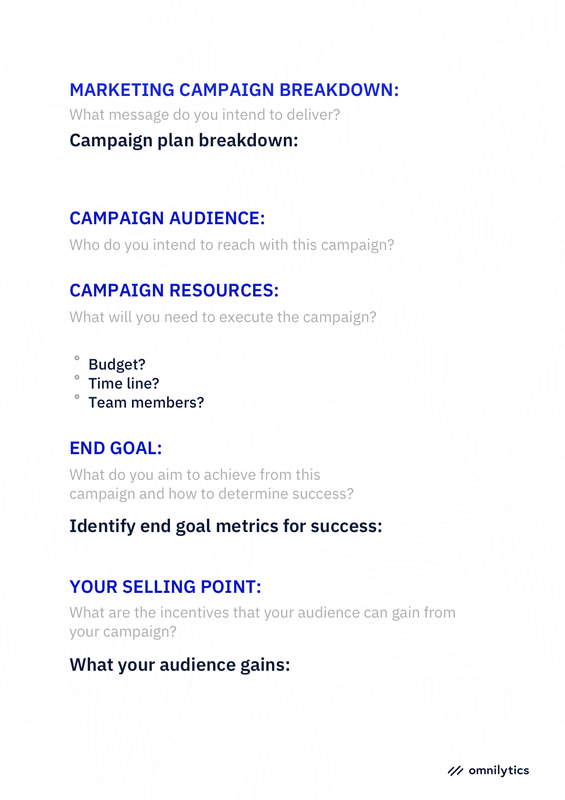 Here is a sample of a marketing campaign template that you can integrate into and measure against your own strategy as you see fit. Mapping out an easily digestible structure helps to set the right course of direction for your campaign.